This common exclamation is an acknowledgment of what we all know—that while heat does have an effect on how comfortable the air is, humidity levels have a potentially even greater impact on our comfort. Spend a summer day in Florida and another in Nevada and the temperatures might be similar but the experiences will be totally different. And yet, it’s likely that your home has temperature controls, but no mechanism for regulating humidity, which is unfortunate, because being able to control the humidity levels in your home is important for a variety of reasons and situations. Not only does low humidity help keep you comfortable in the summer, but the reverse is true in the cold seasons. A humidifier can noticeably improve your comfort and health in winter. If you experience chapped lips, dry skin, and an irritated throat and nasal passages, your air is probably excessively dry and could use some additional humidity. 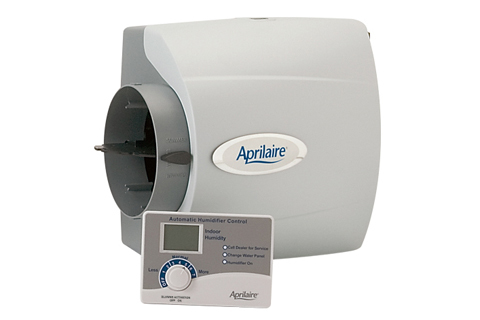 A humidifier is also a matter both of personal comfort and of good home maintenance. As you know, moist air feels warmer. That means that with more humidity, you might be able to set your thermostat a couple of degrees lower while maintaining the same level of comfort, lowering your energy consumption and costs. And if your home has wooden flooring and furniture, a humidifier can help you maintain your investment by keeping the wood from drying out and cracking. That’s why Gough Heating and Air Conditioning recommends you install a whole-home humidifier to reap all these benefits. – A whole-house humidifier runs more efficiently than those portable versions, saving you electricity and maximizing the amount of moisture that can be added to your home. – A central unit will serve all areas of your home rather than just small localized spots. – Whole-house humidifiers are easier to maintain and don’t need to be manually filled with water, since they’re connected directly to water lines. Do Humidifiers Need Looking After? It may seem like adding to your home’s HVAC system implies additional tinkering and maintenance, but we assure you that with our help you won’t have much to worry about. If you’d rather not worry about what the right humidity setting is to set your home to, we recommend that you have an automatic humidistat control installed. With an Aprilaire automatic control, your perfect setting will be automatically determined based on the indoor and outdoor temperatures. If you’ve ever experienced a lot of static buildup or iced-up windows when the air was either too dry or too humid, you’ll never have to worry about that with an automatic control. 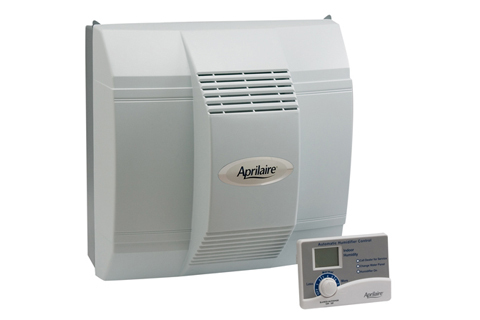 As for maintenance, we recommend that you change the water panel in your humidifier annually; we stock all sizes of Aprilaire water panels to fit your particular model, and we even offer water panel replacement as part of our regularly scheduled furnace maintenance visits. Learning to manage new appliances can be confusing, but we make installation and maintenance convenient—so don’t sweat it.